Twin Cities Daily Photo: Theme Day: "Contrast"
Greetings fellow CityDailyPhoto bloggers as you make your way through all of October's 'contrast' theme day. The photo I've selected with outrageous contrasting colors was taken in my flower garden over the summer. 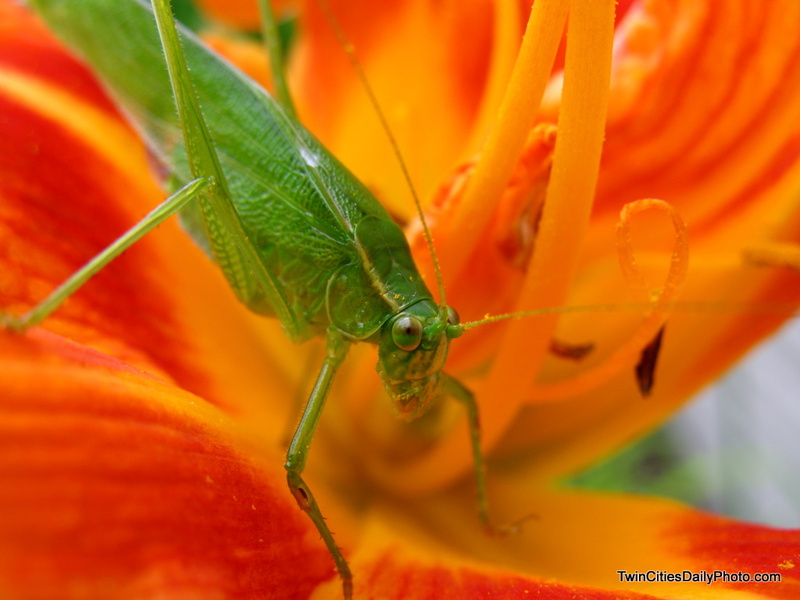 It features a macro shot of a katydid resting on my lily's. He really stood out with the bright orange background. I initially thought a leaf had blown onto the lily, but a second glance, I realized it was an insect. Ran into the house to grab my camera and hoped it would still be there for my return. Success! Oh my goodness, what a shot! The contrast in colour is amazing and what a photograph of this gorgeous insect against the vibrant flower. Just love it! I really like these saturated colors. Amazing catch for the theme day. Your photo is the most striking one on the CDP portal. Absolutely stunning! I love it when a plan comes together. Congratulations on a great shot! Beautiful macro, great color contrast. A lovely and colorful macro. amazing photo and such color and detail. quite gorgeous colors. This one speaks for itself! Stunning image!